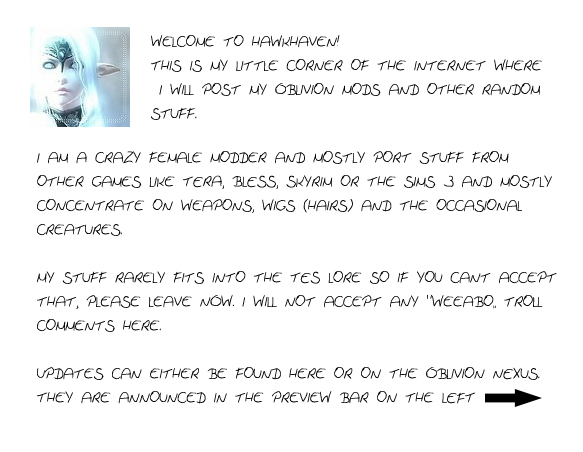 Welcome to Hawkhaven - welcometohawkhavens Webseite! AM IN THE PROCESS OF MOVING MOST OF MY STUFF TO DEVIANTART!!! I love Hawkhaven, but Jimdo is really giving me trouble and 4shared keeps killing my download links. So I decided to move to DA for now, since the Drunken Crafters Inn is there anyway. I am not really present on other social media, so you will most likely find me on DA or the Nexus. Please consider making a DA account to chat or leave a comment, I love hearing from you guys. This website and all it's content is for entertainment purposes only. Nothing you see here is for commercial use. No money is exchanged whatsoever. Modding is a hobby of mine and nothing more. By downloading my mods you agree to this disclaimer. Please keep the modding community a respectful, money-free zone.